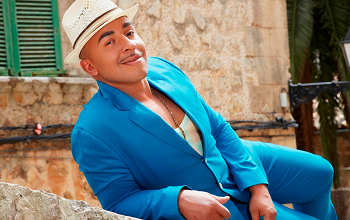 David Loubega, 13 April 1975, Munich, Germany. This global pop sensation brought some much needed style and humour to the charts in the summer of 1999 with his reworking of Perez Prado’s 1949 hit, ‘Mambo No. 5’. Bega’s Ugandan father went to Germany in the early 70s to study biochemistry, and stayed in the country after meeting his Sicilian wife in a youth hostel. Lou showed an early interest in soul music, but it was his discovery of Cuban mambo music while living in Miami that influenced his future musical direction. He adopted a distinctive visual image, part Cab Calloway and part Kid Creole, with his white suit, polka dot handkerchief, spats and Borsalino hat topped off by a snazzy pencil moustache. Bega subsequently signed to RCA Records and released his debut single, ‘Mambo No. 5’, a cartoonish update of the old Prado song. The single, with an irritatingly catchy chorus listing several of Bega’s ex-girlfriends, stayed at the top of the German charts for over 10 weeks and reached number 1 on most European charts. The song crossed over to the top of the UK charts in August 1999, and reached number 3 in the USA three months later. The attendant A Little Bit Of Mambo relied on glossy production values to mask Bega’s limited repertoire. Subsequent releases, including the single ‘A Girl Like You’ and a lame second album, were predictably less successful. The cartoon character Bob The Builder took the song back to the top of the UK charts in September 2001.